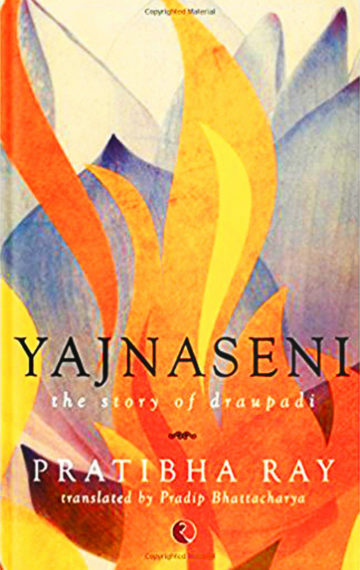 Yajnaseni: the story of Draupadi. Rupa, New Delhi, 1995. Translated by Dr Pradip Bhattacharya. Pratibha Ray’s novel is the winner of the Orissa Sahitya Akademi Award and the Bharatiya Jnanpith’s Moorti Devi Puraskar . Strange as it may appear, Draupadi, the most accomplished heroine of the Mahabharata, happens to be the most suffering, sacrificing, and yet the most misunderstood character from the epic. Though counted among the five supremely virtuous women, honoured as pancha sati in mythology, the name Draupadi still bears stigma and is often contemptuously uttered by people in society as the woman who brought about the greatest war of all times. Draupadi’s Saga: “In a language richly poetic and sensitive, which seems to have lost no beauty in translation by Pradip Bhattacharya, Draupadi’s soul in its poetry, charm and music cries out for love.” Janaky, Indian Express. Of Eternal Appeal: “What we are looking into is the English translation of the famous novel by a distinguished bureaucrat belonging to the Indian Administrative Service and author of 14 published books including one on ancient Indian History and author on the Mahabharata…The novel reads well in its English translation.” M. L. Varadpande, Hindustan Times. Celebrating womanhood: “The celebrated Oriya novel at times admirable translated by Pradip Bhattacharya.” Suresh Kohli, The Hindu. New Myths: “Pradip Bhattacharya’s English translation appears to be smooth.” V. M. Badola, The Pioneer. “Pradip Bhattacharya’s translation shows that Pratibha’s original Oriya must have strong and suggestive whorls of significance. Here is no doubt a welcome addition to the growing shelf of Indian literature in translation.” Dr. Prema Nandakumar. “Nicely written and translated, it has interesting twists on the marriage.” Dr. Alf Hiltebeitel, Professor of Religion, The George Washington University, in Rethinking the Mahabharata (University of Chicago Press), p. 268.